After realizing what an amazing difference it made to eat more fresh, healthy food, I decided to take it to the next step and start using more natural body products as well. 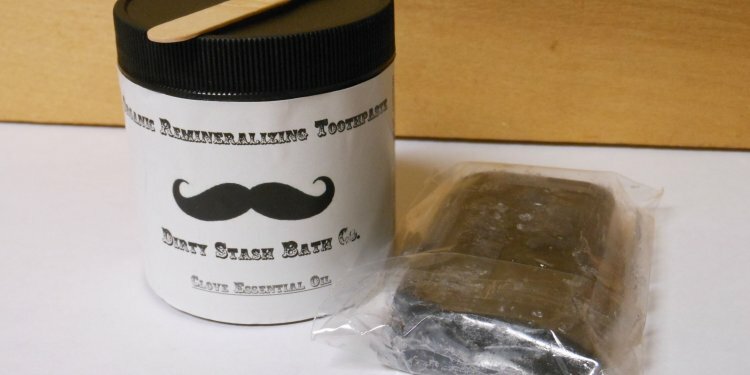 My first purchase was an all-natural toothpaste. I’m loving the stuff, but if you’ve never used a natural toothpaste before, there are some things you should know. First off, the stuff is ugly. Well, some kinds anyway. 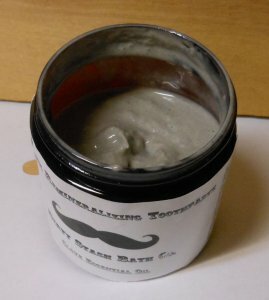 Some looks all white and pretty, but some, like the clove version I’m using, looks like gray mud. But hey, you’re looking for something that works well, not something pretty, right? Second, it feels weird in your mouth. There’s clay and minerals and oils, and it’s not the paste you’re used to. The first time I used it, it seemed weird. However, I grew to like it because of how clean my mouth and teeth felt. Third, it may stain your toothbrush depending on the ingredients. My brush looks kinda gross now, but it works well, so I’ve learned not to care. Natural toothpaste also costs more. About double the cost of a major brand quality toothpaste. It’s worth it though. Now here’s a big one… The stuff melts. The heat of the bathroom will likely make it melt. You have to stir it before each use. If your bathroom stays cool, it stays at a good consistency, or if it gets cold, it solidifies. You just have to get used to it. It’s a little annoying, but the stuff is so good! I keep a1/8 measuring spoon in a cup next to my jar so I can stir it and apply it to my toothbrush. So there’s your primer for all-natural toothpaste. I think it’s well worth the switch, and better if you know what you’re getting into before you buy it. Otherwise, you might think there’s something wrong with the product when really, it’s just not what you’re used to. 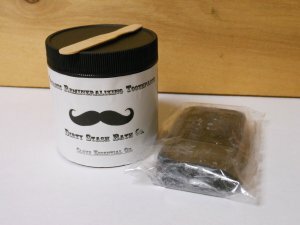 If you’re looking to make the switch, I highly recommend Dirty Stash. I’m using her Clove variety but she has other types, and will even make it custom. She didn’t carry clove until I asked her for it. I have sensitive teeth and needed a sensitivity toothpaste. I asked, and she delivered! It actually works better than the Arm and Hammer Sensitive Whitening toothpaste that I used to buy.